Hall Wood are planning unique new tree top level accommodation in a valley near Pelynt and have worked closely with Cornwall Wildlife Trust and Cornwall Environmental Consultants from the start to ensure the scheme is a wildlife friendly development. Hall Wood is the brain child of Alex King who studied mining at Camborne School of Mines and toured the world through his work as an exploration geologist before deciding to return to his roots in Cornwall. He searched for a special site surrounded by nature where he could incorporate a series of high-end self-catering lodges, without compromising on his strong beliefs that it should also be sustainable and not impact negatively on the local wildlife. Finding the perfect site set in a beautiful wooded valley near the village of Pelynt, Alex turned to Cornwall Wildlife Trust’s consultancy arm, Cornwall Environmental Consultants for advice. CEC carried out various wildlife surveys of the site confirming the presence of ancient woodland, otters, dormice, and deer. Input also included landscape assessment and tree survey work. They were able to advise on how best to manage the site for nature and mitigate against any negative impacts from its development. The site was formerly planted with conifers on its upper slopes whilst the valley bottom has patches of ancient woodland. 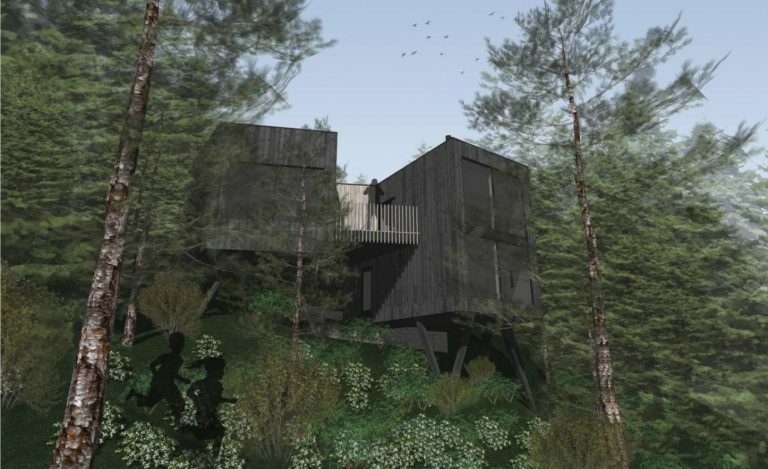 Hall Wood plans to protect the ancient trees, and with a renowned local architect, Arco2 Architecture Ltd, has designed timber framed units on stilts which will be sympathetically integrated into the landscape to give the impression of living in the tree canopy. The woodland in which the lodges are set will be managed as a nature reserve, and the site has been designed to ensure these habitats are enhanced and preserved throughout its life. Hall Wood guests will be encouraged to support local businesses and producers whilst on site. Low-emission transport links into local places of interest will be provided as the owners are keen for the local communities to benefit from the income generated by guests staying at the site. They have estimated that this could amount to over £300,000 annually. Hall Wood has recently joined the Trust’s Business Support Scheme. Click here to find out more.